Cook rice according to package directions. I’m currently loving my Instant Pot for making rice. Precook the 5 lbs of chicken in the method that’s easiest for you on cooking day. You can also use ground beef, pork, or ham. Use the meat you have available. Also, remember that you can cut back on the amount of meat you use if necessary. (I use 5 lbs because that ends up being about 2 to 2 1/2 cups of cooked meat per 9×13 pan when I’m doing five full pans.) After your chicken is fully cooked, simmer the precooked shredded chicken in a large pan with 2 cups of soy sauce on medium heat for a few minutes. Stir the cooked meat in the soy sauce as necessary to mix in the flavor. Once soy sauce is well-blended with the meat turn off heat and set aside. Pour 5 lbs of frozen mixed vegetables in a separate pot. Cook on medium heat with 1/2 cup of Sesame Seed Oil and gently toss. Scramble 18 eggs and set aside. Combined the cooked rice, cooked meat of choice, mixed vegetables, and scrambled eggs. This is where you may have to get creative with your pots and bowls for mega mixing. I use my 22 qt stock pot and another large container to combine all these ingredients. Once your ingredients are combined creatively, divide the Chicken Fried Rice mixture evenly amongst 5-9×13 pans. 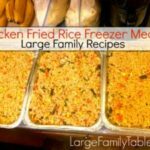 Set the desired pans of Chicken Fried Rice out in the refrigerator the evening before you’d like to serve them.